June 26, 2018 By Elizabeth Lindemann 2 Comments / This post may contain affiliate links. I love this Mexican twist on an American classic! Mexican Baked Beans with Chorizo are smoky, sweet, and spicy all at once. They’re bursting with yummy flavor. This recipe makes a TON, it’s cheap, and it’s freezable. The beans are perfect as a side at your next BBQ (like the Fourth of July), piled on toast, or with fried eggs for brunch. Baked beans are a staple all over America. Traditionally, they’re made with bacon (and lots of it!) and navy beans. This Mexican version of baked beans is made with chorizo instead of bacon, and pinto beans instead of navy. I used Cacique® Pork Chorizo for this recipe. 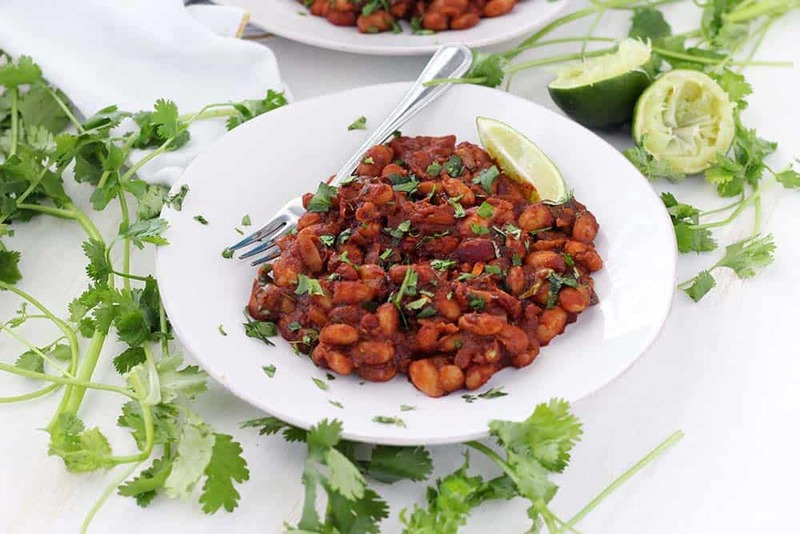 It’s a highly seasoned meat that helps infuse every bite of these beans with amazing flavor. It was the perfect way to elevate these beans to the next level and make them extra tasty! There are a lot of kinds of chorizo you can buy at the store, and it can get confusing. There’s Spanish chorizo, which is more like a salami, and there’s Mexican chorizo that comes in links, packed in casings. Cacique® Pork Chorizo is like sausage without the casing- it comes packaged in a tube. And Cacique® also makes beef chorizo as well as soy chorizo, for a vegetarian option. The chorizo breaks down into the tiniest pieces when you cook it with very little effort. It reminded me more of a thick chili paste rather than a meat product. This made it super easy to work with- I just cooked the chorizo up in a dutch oven, then began to add the onions, garlic, spices, beans, and other ingredients. 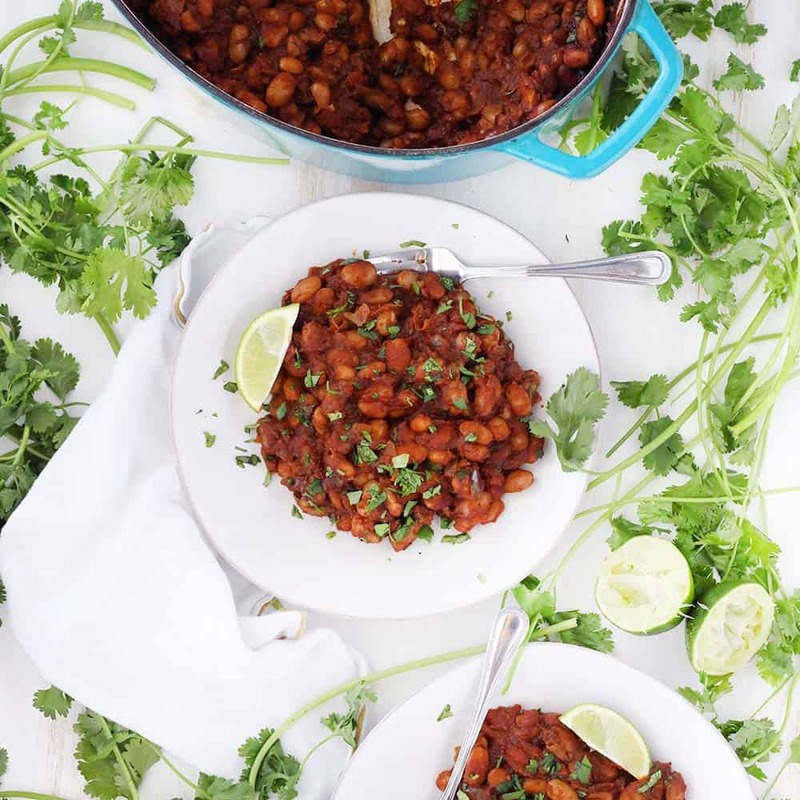 This other thing I LOVE about this Mexican Baked Beans recipe is that it’s all made in one pot! 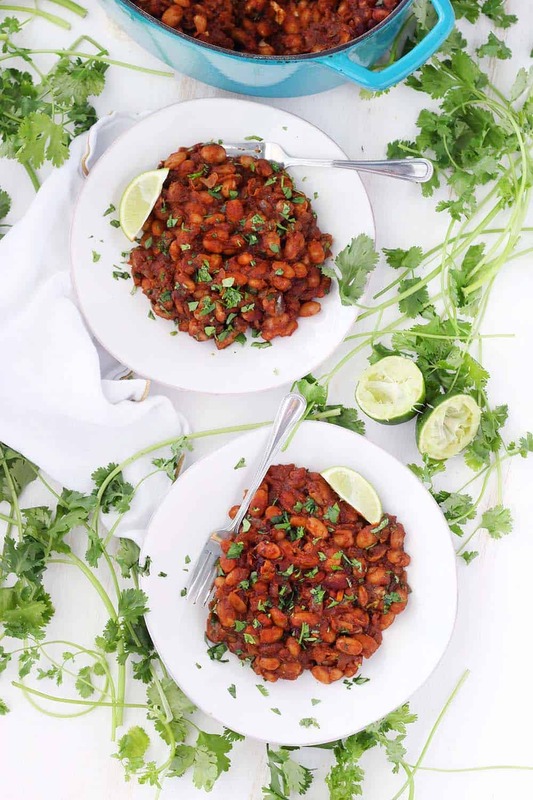 You can use canned pinto beans or, if you want to save more money, dried (I cooked up a pound of dried beans before making this- it’s easy to do in your Instant Pot or slow cooker). Many traditional baked beans recipes call for using pre-made canned baked beans or pork and beans, which can have a lot of added salt and other ingredients. I love using plain beans and adding my own ingredients to season them (like the super flavorful chorizo!). 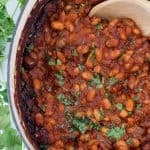 Besides the flavors from the chorizo, there are so many other yummy flavors in these baked beans. For spice, I used chopped fresh jalapeño peppers. I deseeded them, but the jalapeños in Texas tend to be both extra huge and extra spicy, so it added plenty of spicy flavor (but not so much that my toddler wouldn’t eat it!). If you aren’t a fan of heat, feel free to replace them with a chopped bell pepper, or omit entirely. For smokiness, I used smoked paprika. It’s my favorite way to add smoky flavor to recipes, like in this smoky Mexican pulled chicken or this smoky sweet potato soup with bacon and blue cheese. To enhance the Mexican flavors, I also added some cumin (my fave) and chili powder. And for sweetness, I used the traditional molasses and brown sugar that’s added to most baked beans recipes. Beans on Toast. Toast some good bread, drizzle with olive oil, and rub with a clove of garlic. Then, top the toast with the baked beans, along with some fresh cilantro, a squeeze of lime juice, and, if you want, some crumbled queso fresco or cotija cheese! Beans with Eggs and Avocado. Put a fried egg on top of the beans, along with some sliced avocado, salt, pepper, and a squeeze of lime juice. On a tortilla. Make a taco out of the beans! In order for this to be a one-pot recipe, you’ll need an oven-proof pot or skillet. It doesn’t need a cover. I used my dutch oven, because I love how deep it is (meaning you can stir vigorously without worrying about making a mess). You can also use a large cast iron skillet. If you don’t have an oven-proof pot or skillet, cook up the ingredients in a regular pot, then transfer everything to a casserole dish to bake. 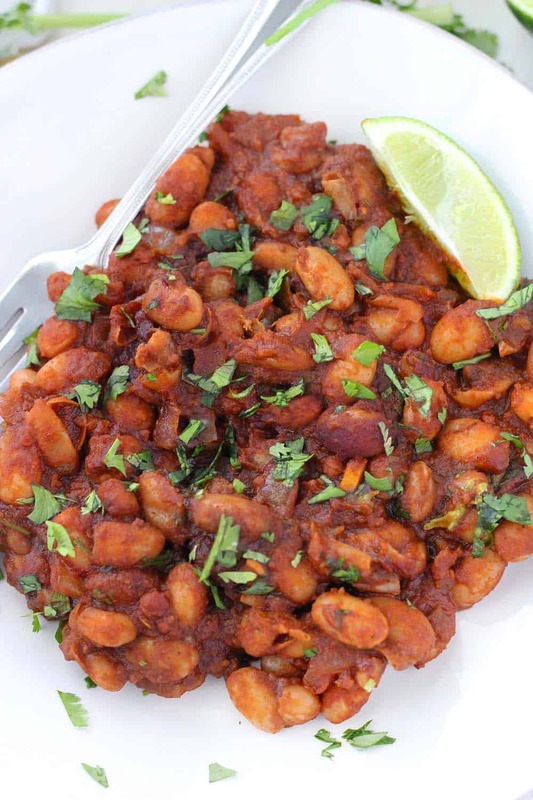 Here’s the recipe for Mexican Baked Beans with Chorizo! 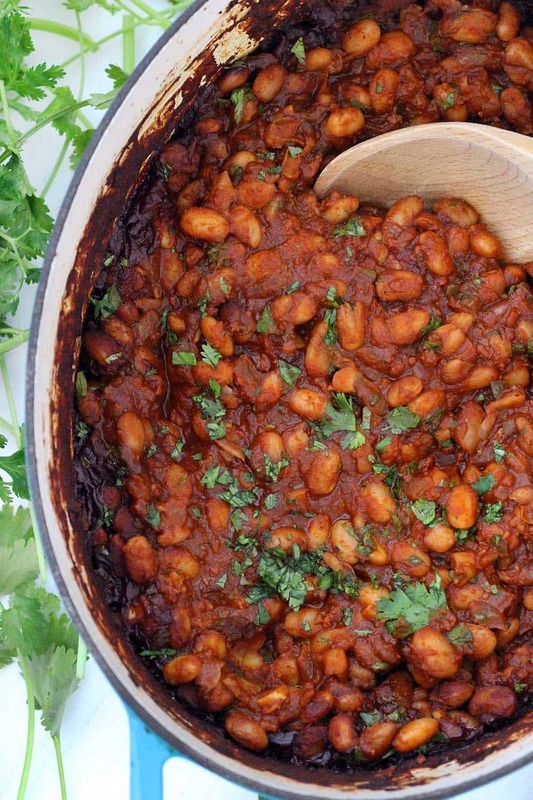 These Mexican Baked Beans with Chorizo are smoky, sweet, and spicy! This gluten free recipe makes a TON, and it’s freezable. Serve as a side at your next BBQ, piled on toast, or with fried eggs for brunch. In a dutch oven (or other heavy, deep oven-proof skillet or pot), cook the pork chorizo over medium-high heat until browned, breaking it up into small crumbles as you go. Add the onions and jalapeño peppers. Sauté until softened and browned (about 3 minutes). Add the smoked paprika, chili powder, cumin, and salt. Stir to coat. Add the tomato paste. Stir to coat and cook for about 1 minute, until it starts to turn a deep color. Add the molasses, brown sugar, and apple cider vinegar and stir until sugar has melted and all ingredients are incorporated. Add the drained and rinsed beans and water and stir. Place pot in preheated oven and bake for 45 minutes to an hour, uncovered, until thick and bubbly. Stir in lime juice and fresh cilantro. Serve hot with extra cilantro for garnish. Not a fan of spicy? Feel free to replace the jalapeño peppers with a bell pepper. Or, if you love spicy, leave the seeds in. For a vegetarian option, use Cacique® Soy Chorizo. They also make a beef chorizo if you don’t want pork. I made these today for a Fourth of July cookout. Everybody loves them. I seeded the Jalapeños and they had just a hint of spice – DELICIOUS!!! Thanks for sharing the recipe!! Yay! So happy you liked it, and happy fourth!